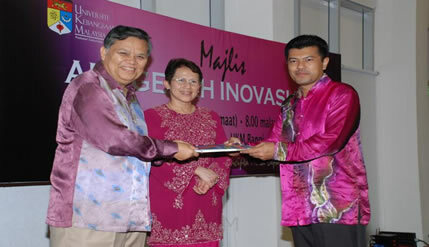 Bangi, May 3, 2010 – Director of UKM Medical Centre, Prof. Dato’ Dr Lokman Saim was the main recepient of the UKM Innovation Award 2009 given out in conjunction with the Fifth Innovation Award Night held at Puri Pujangga, UKM, Bangi on april 30th. Prof Lokman who is also the Dean of Medical Faculty received a cash prize of RM5,000 and an Appreciation Certificate from the Chaiman of the UKM of Board of Directors, Tan Sri Dr Mazlan Ahmad. The Vice Chancellor’s Quality Award went to the Department of Rehabilitative Services winning a cash prize of RM10,000 and an Appreciation Certificate. The two awards were part of the UKM’S annual prestigious award given out that night. Two students, Safarizmal Md Saad and Amy Poh Ai Ling were the recepients of the Excellent Services Award for the undergraduate and graduate categories respectively. Both received cash prizes of RM1,000 each together with an Appreciation Certificate each. For the research category, Prof Dr Wan Ramli Daud from the Department of Chemical Engineering and Processes, Engineering Faculty received the Researcher Award (Individual), Dr Mohammad Tariqul Islam from the Space Science Institute received the Young Researcher Award while Prof Dr Siti Rugayah Tibek from the Institute of West Asian Studies received the Award for Team Research. They received cash awards of RM2,000 to RM5,000 plus Appreciation Certificates. Nine academic staffs received the Outstanding Teaching Award. They were Ezad Azraai Jamsari and Anuar Puteh from the Faculty of Islamic Studies, Dr Fazilah Idris from the Centre of General Studies for Social Science, Assc. Prof Dr Andanatusti Muchtar from Engineering Faculty and Assc. Prof Dr Juhana Salim from the Faculty of Technology and Information Science for the science group, Assc. Prof Mohd Shahrir Mohamed Said from the Medical Faculty, Dr S Nagarajan M P Sockalingan from Faculty of Dentistry and Dr Normah Awang together with Assc.Prof Dr Poh Bee Koon from the Faculty of Associate Health Sciences for the health group. They each received cash prizes of RM3,000 and Appreciation Certificates. Vice Chancellor Prof Tan Sri Dr Sharifah Hapsah Syed Hasan Shahabudin also received an award for General Writing for Newspaper. She received RM3,000 cash prize and an Appreciation Certificate. Earlier in her speech, Prof Tan Sri Dr Sharifah said the awards were given out to motivate and encourage the recipients to continue to strive for the best while inspiring other staff to be more committed and to put in more concerted efforts in their various fields of studies for the future. This year is more special to UKM as it is celebrating the 40th anniversary of its establishment thus making the outstanding achievements steeped in the university’s 40 years of culture and tradition by providing ideas and creative programmes to heightened quality and productivity. She congratulated all the staff for their efforts in enabling the university to surpass its self accreditation benchmark but reminded them not to be satisfied or become vain with their achievements thus far but to strive harder to move to a much higher plane. Artistes from Artisukma, UKM Cultural Centre gave a splendid performance that night.